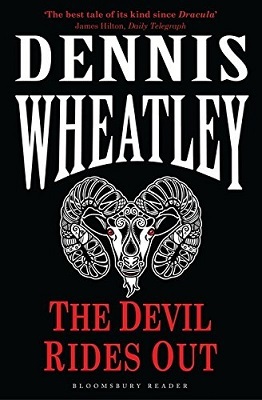 The Devil Rides Out is a Dennis Wheatley novel about black magic and the occult. It was first published in 1934 and the story begins with a young man, named Simon Aron, becoming involved with the wrong crowd. It’s then up to his friends, Rex van Ryn and the Duke de Richleau, to save him. This is easier said than done because the crowd that Simon has fallen in with are members of a coven of Satanists, so Rex and the Duke are forced to resort to desperate measures. The Duke knocks Simon out cold; then he and Rex carry him to their car. The Duke de Richleau is a very level-headed man, but before too many pages have been turned it becomes apparent that he has hidden depths and is quite an expert on the occult. Rex is different. He doesn’t believe in witchcraft or black magic. In fact, he finds the Duke’s actions a little over the top and only goes along with him because they have been through so much together in the past and he has learned to trust the Duke’s judgement. But black magic? In 1930s England? Nobody believes in that mumbo-jumbo anymore and he can hardly believe the things that his friend is saying to him. It isn’t long before Rex is forced to believe in all these things. He cannot doubt the evidence of his own eyes and some of the things he witnesses defy logical explanation. The man who has bewitched Simon is called Mocata. He is a powerful magician and he needed Simon for a very important ceremony that was to take place on the night the Duke and Rex intervened. Simon’s birth date is very specific to Mocata’s needs. It’s impossible for Mocata to replace him and he needs to get him back. He does get him back as well, so the Duke and Rex are forced to play detective and try to find their friend again. They also have a race against time on their hands because once Simon has been baptized at the Black Mass it will be too late—he will be lost forever. The Devil Rides Out is an interesting book and I thoroughly enjoyed reading it. The friendship of the three main characters is an essential ingredient of the story and helps bring it to life. Simon is not a bad man, he is just a man who gets in with the wrong people, is in over his head, but is lucky enough to have friends who will face the powers of Satan to save him. There is also a rather interesting sub-plot to the story, involving a tall and graceful beauty called Tanith. Rex falls head over heels in love with her and you will probably not be surprised to learn that she becomes a key player in the story. Rex’s love seems to be doomed from the start though because Tanith tells him that she has not got long to live. There are some interesting characters in The Devil Rides Out and although the book does have its darker moments, it also has some rather humorous scenes as well. For instance, on the second occasion that the Duke and Rex rescue Simon he is naked and they are forced to dress him in whatever they can get their hands on. With only the items from a sporting goods shop to choose from, Simon’s dress is colourful, to say the least. The Devil Rides Out is 320 pages long. It is not a blood and gore fest and neither is it filled with graphic descriptions of Satanic orgies. If those are the kind of things that you expect from an occult horror story I am afraid that this book is not going to be for you. If, on the other hand, you are looking for a well crafted, well researched and entertaining read that might cause a few goosebumps and force you to sleep with the light on, you might enjoy the strange, dark journey that this book will take you on.